Music Review//Andrew Cream - Adapt and Adjust E.P. Ah, the sound of a full hearted voice over a nicely strung guitar. Many years ago this would be an utterance perhaps out of the ordinary. After all, since when has there been a shortage of acoustic guitars and well voiced singers in combination? The answer to that perhaps is rarely. Andrew Cream’s recently released E.P. slipped in under our noses and recently hit us in a very punk way with its loveliness! Can the word lovely and punk go together you ask? Yes – they can. Not just because we say so, but because there’s an acoustic element to the record that ties the whole sonic package together neatly. Opener Leaving It Behind is a powerful opening statement – the guitar up in the mix with the strong vocals and making no issue of turning this off before it gets going because it does so immediately. Cream’s voice is a confident one that demands attention even without the guitar backing and this is proven over the E.P’s four tracks time and again. The singer songwriter acoustic genre can often benefit from an augmentation and (regardless of whether it’s necessary or not) the punk elements here in the rougher edges to the production add much to the mix. There’s many an acoustic performer who will get lost on the mix of drinks and atmos in the bar but Cream is not one of them. There is certainly an extra dimension to this music and over the E.P. he proves that the multiple listens were well worth it. 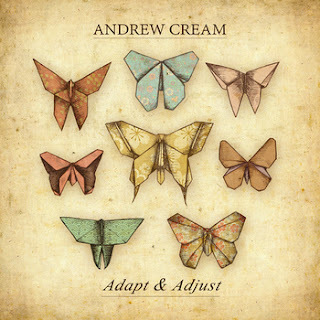 One more song here could have been too much but with four solidly crafted songs Andrew Cream keeps you in the loop for much longer than music of this genre would normally do and that can only be a good thing. Look out for this man on tour near you soon!